Environment: Microscopic inclusions in mantle-derived pyrope crystals. The mineral is inferred to have co-precipitated with the pyrope host in the presence of a fluid or melt phase at 650-750 de g C and 20-25 kbar pressures. Locality: Garnet Ridge, an ultramafic diatreme on the Colorado Plateau in Arizona, USA. Link to MinDat.org Location Data. 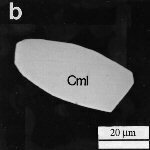 Comments: Backscattered electron (BSE) image of a grain of carmichaelite included in pyrope in GRPy-40. (AmMin 85:794). Location: Garnet Ridge, an ultramafic diatreme on the Colorado Plateau in Arizona.. Scale: See Image. note: Specific Gravity of Carmichaelite =3.95 gm/cc. U=PECarmichaelite x rElectron Density= 42.30 barns/cc.